Last year, I spent a week hopping around Germany’s Bavaria region in December, exploring several different Christmas markets. What a great trip! I knew I’d have fun, but I was genuinely surprised at what a relaxing and delightful week it was. 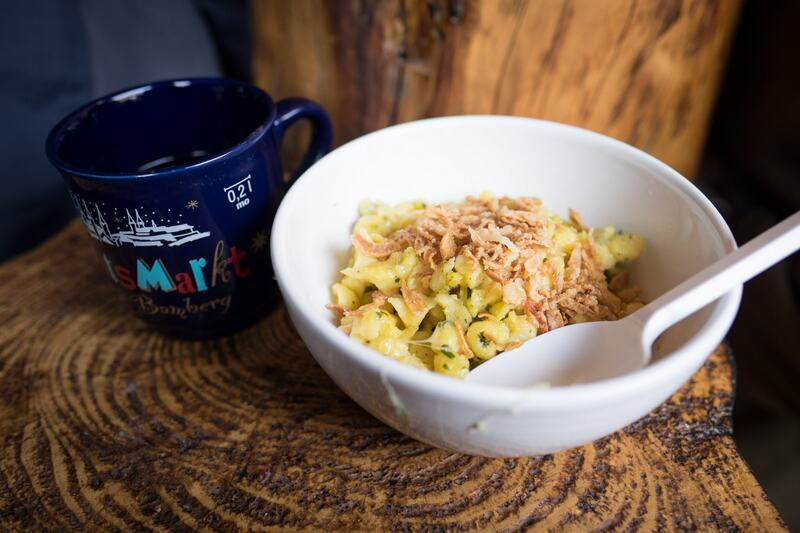 How could you not enjoy a week of holiday spirit, mulled wine, and delicious food? At the time I wrote a post showcasing my favorite parts of the trip, but I pointed out that it was December and it would make more sense to publish a trip planning post in September or so. And here we are! Why plan a German Christmas markets trip? If you’re looking for an adult-oriented Christmas activity, your two choices are watching Love, Actually and drinking your face off at an office Christmas party. That’s not the case in Germany. 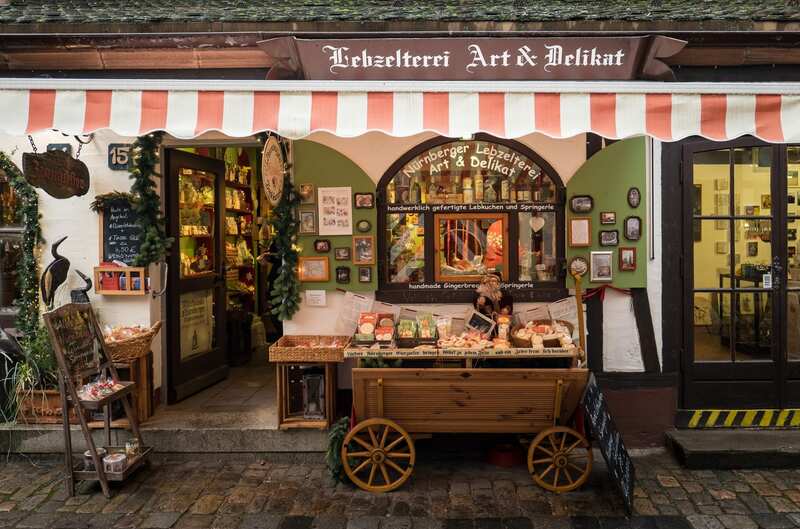 German Christmas markets are located in virtually every town. Though they have their share of children’s sections and goods for sale, these markets are first and foremost for adults looking to have a good time. 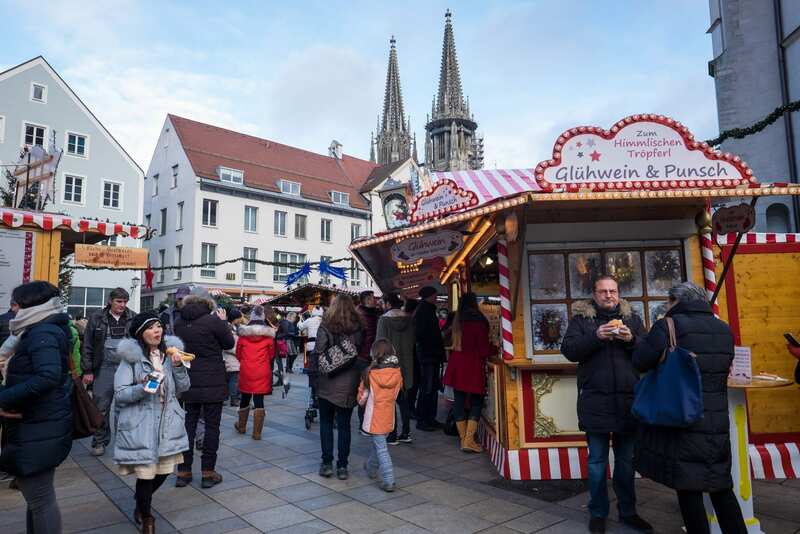 They’re about eating delicious food, munching on lebkuchen (gingerbread) and drinking glühwein (mulled wine) or kinderpunsch (nonalcoholic fruit punch). They’re about spending a jolly good time with your friends — but they’re not about getting drunk. My German friends tell me that starting in late November, nobody goes out to bars — everyone just meets at the market! 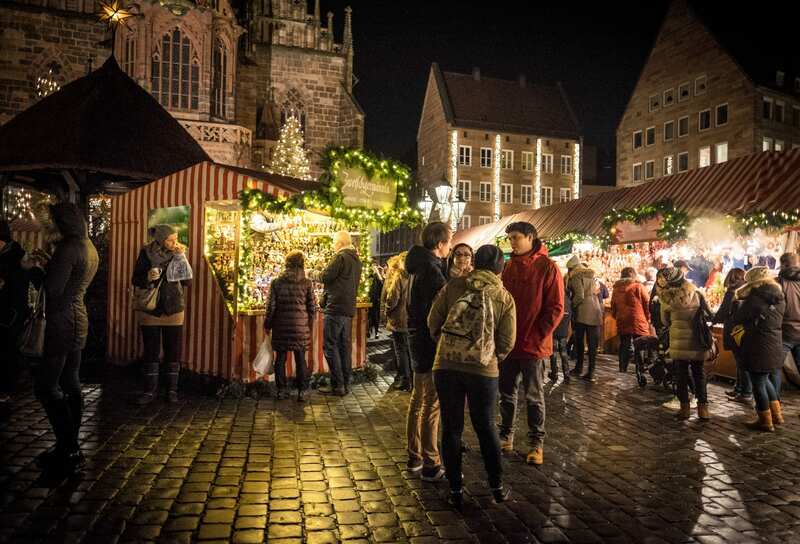 Spend time researching the best Christmas markets in Germany. 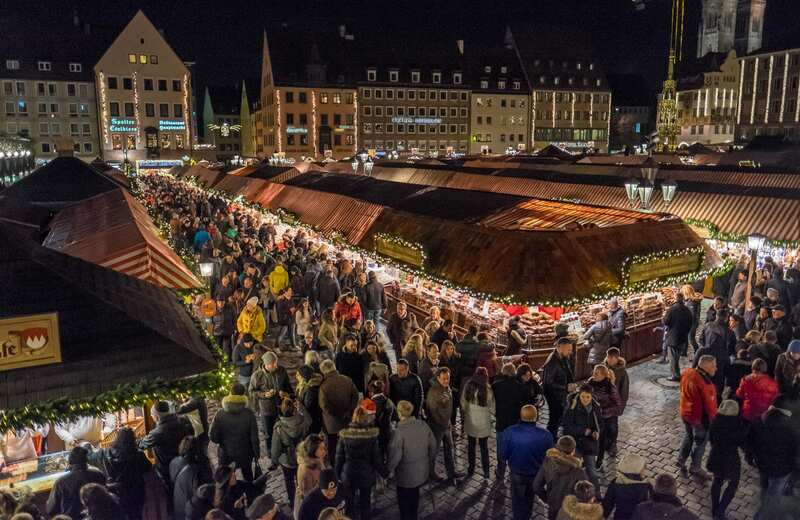 Nuremberg is home to the largest Christmas market in the world. Dresden is home to the oldest Christmas market in the world. Berlin has more than 60 different Christmas markets; Munich has more than 30. Konstanz is famous for its stunning location on the banks of Lake Constance, the Alps in the background. There are LGBT-oriented Pink Markets in Munich, Frankfurt, and Cologne. Plan a trip for late November through December 23. Germany’s Christmas markets usually start around November 20-25 or so, and the final date is almost always December 23, as Germans celebrate Christmas on December 24. Double-check the dates before you book your trip. Whatever you do, don’t come to Germany and expect markets to stick around after Christmas! Concentrate on one region in Germany and explore it in depth. As tempting as it may be to cover Germany from corner to corner, I recommend planning a trip concentrated on one region. Distances will be shorter, but there will still be a lot of variety in the cities and towns you visit, and you’ll get to know the nuances of a region and the slight variations in the different towns. I recommend basing from two or three cities and using the train to make day trips. Get a German Rail Pass. Take it from me — the best way to travel Germany is by train! I absolutely love traveling Europe by train and Germany has some of the nicest trains on the continent. Getting a German Rail Pass can be a great way to save money. You can either get a pass that covers 3-15 days of unlimited travel or get 3-15 days of train travel within a month. I recommend the latter. For my trip (see the itinerary below), a pass for 5 days of rail within a month would cover all the trains I needed. In Germany you don’t need to book reservations on most trains, so you can simply show up at the station, hop on a train, and show your pass to the conductor when he or she comes by. That’s a big difference from France or Spain, where you often have to book trains in advance and pay a supplemental fee, even with a pass. Even so, it’s a good idea to plan out your journeys in advance and price them out on bahn.de, Germany’s rail site. It might be cheaper to buy tickets individually or just buy the rail pass to cover the long journeys while paying for cheap short journeys out of pocket. Visit small towns as well as cities. Over the years I’ve noticed that American tourists visiting Europe tend to travel from major city to major city, concentrating on the big names and ignoring the smaller towns. European tourists are different, however — they tend to visit one major city and travel around the surrounding region. 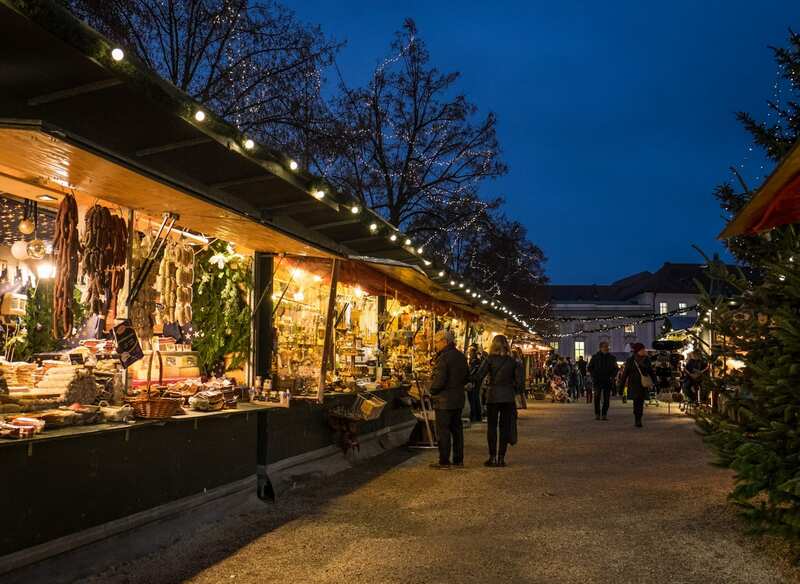 For exploring Christmas markets, take the European approach. Many of my German friends tell me they prefer the Christmas markets in smaller cities, as they tend to be less congested. Don’t think that for a Germany trip you need to visit Munich, Berlin, and Hamburg. You could concentrate on Munich and visit Augsburg, Regensburg, Passau, and Nuremberg. You could concentrate on Berlin and visit Potsdam, Leipzig, and Dresden. You could concentrate on Hamburg and visit Lübeck and Bremen. As much as I enjoyed Bamberg and Passau, I haven’t visited as many small towns in Germany as I’d have liked to — some high on my list Rothenberg ob der Tauber, Quedlinburg and Trier. Try each town’s local delicacies. Each German town has its own food specialties, whether it’s a certain kind of sausage or a baked good you’d struggle to find elsewhere. Try them all! Any dish that has the name of the town in it is usually a local dish. Not sure? Ask! Most Germans speak at least a little bit of English and all Germans are eager to show off their towns. Each town has its own handicrafts, too. 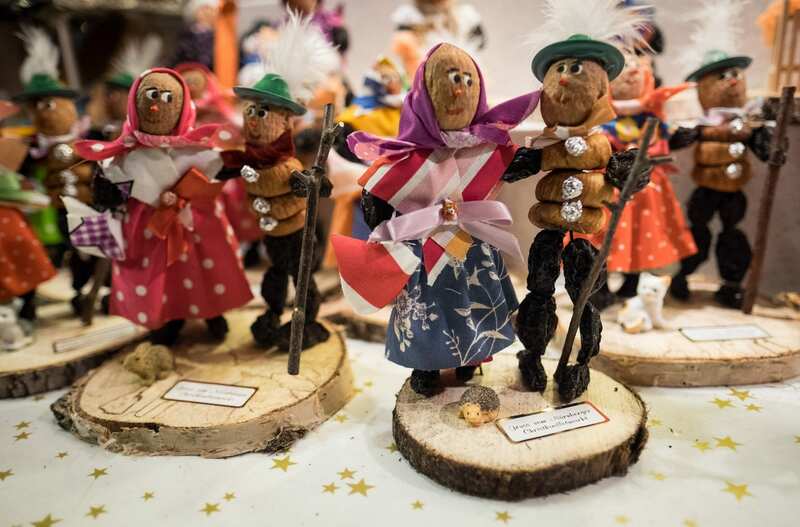 The prune people, pictured above, are a specialty of Nuremberg and can be found throughout Bavaria. Dress warmly and wear good shoes. The forecast might not look too cold, especially if you’re used to freezing winters, but the cold compounds when you’re outside for hours at a time. Likewise, you’ll be standing for hours, and you’ll want your feet to be as comfortable as possible. This is a trip for your heaviest winter coat, gloves, scarves, hats, thick socks. I am a huge fan of Speakeasy Travel Supply scarves, which have a secret passport pocket and are ideal for travel. Get 10% off with the code ADVKATE. Consider investing in smartphone gloves, which allow you to keep your fingers warm while Instagramming away. For shoes, you don’t have to wear sneakers — but wear shoes that are warm and have good support. I wore knee-high leather boots most days. Glühwein is the primary beverage of German Christmas markets, and each year, the cities create new designs for their mugs. When you order glühwein, you pay a small deposit for the mug — usually around two euros. You can return the mug if you’d like and get your deposit back, or you can keep it! They make great souvenirs to bring home. I would love to have a Christmas party at my place this year. We’ll see if that actually happens, but if I do, I am going to have everyone drinking out of my glühwein mugs! If you see something weird…buy it! You’ll see the occasional weird and awesome item for sale at a Christmas market, buy it! Don’t assume you can find one in the next town — you might not see another one again. And I guarantee you will find a use for it, or a friend for whom it’s a perfect gift. 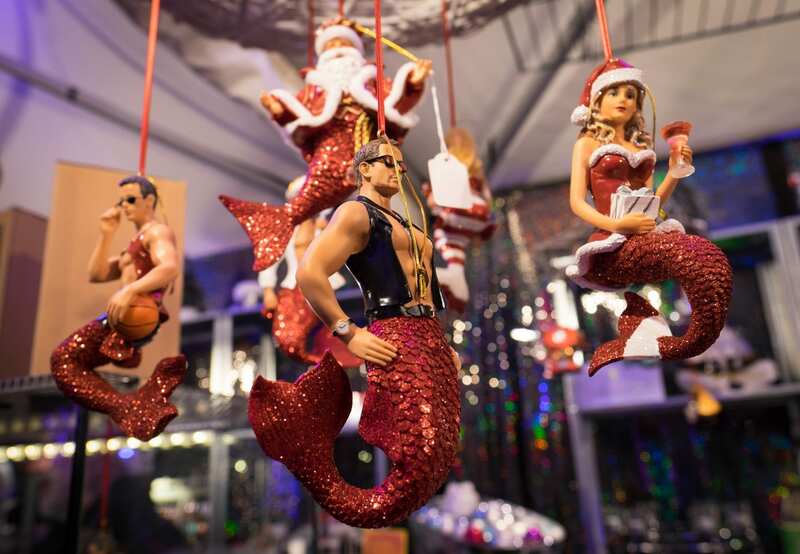 One of my regrets is that I didn’t buy any of the hunky merman ornaments for sale at the Pink Market in Munich. At the time, I told myself, “What are you even going to do with that, Kate?” Well, I bet you I would have found a use for it! Last year I traveled around Bavaria, which is a beautiful part of Germany. I joke that Bavaria is the “Texas of Germany” — it’s home to traditions like beer steins and lederhosen that people tend to associate with all of Germany but happen to be Bavarian, not German. You see lederhosen in Berlin about as often as you see cowboy hats in New York — it’s not a thing there. This itinerary worked well, but I’m not the biggest fan of switching accommodation frequently, so I would recommend spending two nights in Regensburg and doing a day trip to Passau instead. Another Bavarian city that I love is Augsburg; I recommend adding it to your itinerary if you have extra time. Essential Info: I flew in and out of Munich and traveled by train throughout Bavaria. My tickets were purchased a la carte, but you might save money with a Eurail (non-EU resident) or Interrail (EU resident) pass or the German Rail Pass, which is strictly for Germany. I recommend pricing out your legs and comparing the total cost. Don’t forget day trips! Germany is one of the best countries to use rail passes because you almost never have to pay additional reservation fees for the fast trains, unlike France, Italy, and Spain. Plus, if you’re over 26, you’re automatically in first class. For a Christmas market trip or a trip where you’re doing lots of day trips, I find it best to stay in a hotel within a short walk of the train station (especially in small towns) because it will make your life a million times easier. In Munich I stayed at the Hotel Präsident, a good, central three-star close to the main train station and in walking distance of a lot of Munich attractions. Rates from 192 EUR ($199). I also stayed at the Westin Grand Munich Hotel, an excellent five-star business hotel, but it’s not in the center of town; it’s well connected by U-bahn though. Rates from 438 EUR ($516). Find more Munich hotels here. In Nuremberg I stayed at the Congress Hotel Mercure Nürnberg, which I do not recommend because it’s isolated and far from everything (11-minute walk to U-bahn or 14 EUR ($16.50) taxi to the train station), and one night the front desk gave my key out to a stranger who barged into my room. (Always double-lock your door!!!) The manager was good about making things right, but I wouldn’t stay there again because of the location. Rates from 94 EUR ($111). Find other Nuremberg hotels here. In Regensburg I stayed at the Hotel Central Regensburg City Centre, which was spacious, comfortable, close to the train station and a short walk from the old town. Rates from 84 EUR ($99). Find more Regebsurg hotels here. In Passau I stayed at the IBB Hotel Passau City Centre, a good mid-range hotel, which was right across from the train station and a short walk from the old town. Rates from 75 EUR ($88). Find more Passau hotels here. Don’t visit Germany without travel insurance. I use and recommend World Nomads. On this trip I had to visit the hospital after hitting my head and sustaining a concussion. The ER I visited in Munich, Klinikum der Universität München, charges non-EU insurance-holding residents 300 EUR ($353), but because I use World Nomads, I got that money refunded! 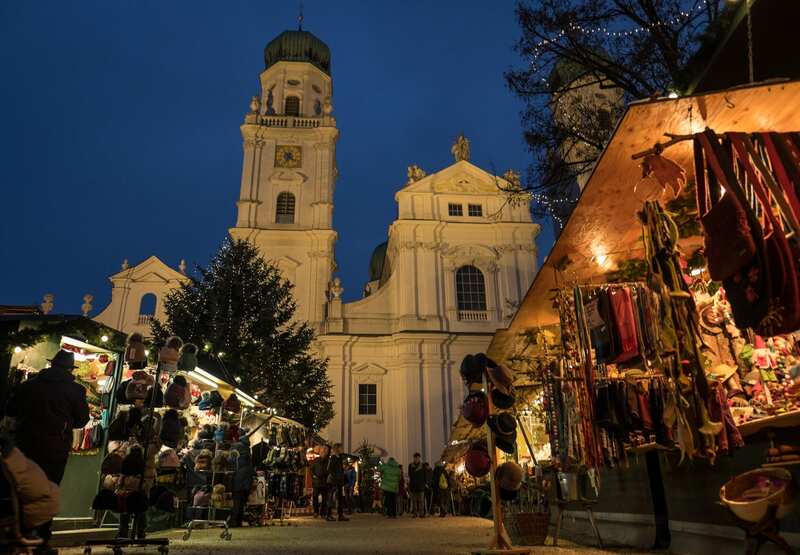 Have you been to Germany’s Christmas markets? What tips would you give?